Dancers & Choreographers Cid Pearlman and Collette Kollewe came into KZSC to talk about the newest CID PEARLMAN PERFORMANCE, Economies of Effort: 3 at the Felix Kulpa Gallery in Santa Cruz. The Show dates are March 17-20 & March 24-27, 7:30 & 9:30pm. It’s free admission and reservations suggested and entry is limited to 35 people per performance. Go to cidpearlman.org to reserve your spot. Cid Pearlman to Debut Final Work in ‘ECONOMIES’ Trilogy at Felix Kulpa Gallery. 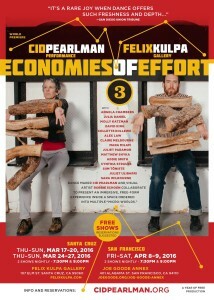 ECONOMIES OF EFFORT: 3 opens at the Felix Kulpa Gallery in Santa Cruz, Thursday, March 17, and runs two weekends through March 27. It continues at the Joe Goode Annex in San Francisco, Friday to Saturday, April 8 – 9. 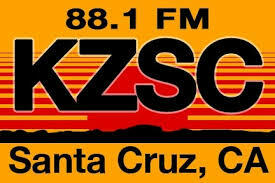 Two shows are offered nightly at 7:30 pm and 9:00 pm both in Santa Cruz and San Francisco. All performances are free to the public, but reservations are recommended. To reserve a space, visit cidpearlman.org. Created in a collaboration between veteran dance maker Cid Pearlman and visual artist Robbie Schoen, ECONOMIES OF EFFORT: 3 presents an immersive, free-form experience inside a space ordered into multiple “micro-worlds.” Audience members are invited to move freely between simultaneous areas of activity — of dancing, building, printmaking, stacking firewood and more. 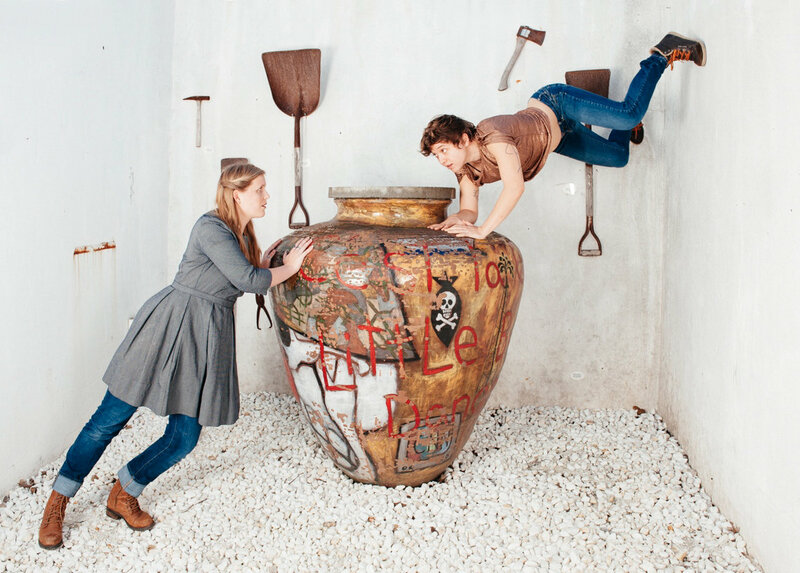 Anchoring each performance area will be found art, design and installations by Schoen. ECONOMIES OF EFFORT: 1 premiered one year ago in San Francisco, and was followed by ECONOMIES OF EFFORT: 2, commissioned by Sõltumatu Tantsu Ühendus in Estonia. Culminating the series, ECONOMIES OF EFFORT: 3 involves an enlarged ensemble of 15 performers representing three generations, including one of the Estonian artists who participated in the second installment.